There's a particular scene at the very end of Titanic that has always stuck with me. Silver-haired Rose gets in bed and the camera pans across a series of framed photographs on her bedside table. We see photos of young Rose in various scenarios, in a cap and gown, climbing aboard a plane, sitting atop an elephant, surrounded by family members, beaming on a horse on the beach. All photos meant to quickly convey a life well lived, a long and fulfilling life of adventure and happiness. I wonder what photos silver haired Selena will keep on her nightstand. Graduations, weddings, Jessica, grandbabies and great grandbabies. What travel moments will I want to surround myself with? Me on a camel at the great pyramids of Egypt will definitely be on that nightstand. Once it was decided that we would be visiting the pyramids, I was so excited that every time I thought about it I'd get tears in my eyes. It's just one of those places that you learn about from such a young age. I never dreamed that I'd actually get to visit one day. Before visiting I always pictured the pyramids off in the desert distance, but the Giza Necropolis is just on the outskirts of the city. This place used to be teeming with tourists, but things are very different now. There were probably more touts than tourists these days. If you're researching a visit to the pyramids, you'll read all about the touts and harassment by hagglers. We did see this, but we were prepared to deal with it and also had our private tour guide from Egypt Tours Portal to help us navigate the hard sell. Matt is going to write more about this in a future post. There are definitely ways to handle this without too much difficulty. It's such a surreal experience to actually walk up to a pyramid and climb up a few levels on the massive stones. It's definitely a Pinch Me moment to visit the oldest of the Seven Wonders of the Ancient World. It did not disappoint. I knew that I wanted to ride a camel at the pyramids. If you read my blog or know me at all, you know that I'm not a very adventurous person. But I was determined to experience this. I probably shouldn't admit this, but I spent hours googling how to get on and off a camel safely. I even watched YouTube videos. I almost chickened out. I could just picture taking a tumble into the sand. I think meeting Casanova at the beach helped. We even brought apples with us for the camels. Luckily, we didn't have to bother with all of the haggling and deciding which camel handler to use. Our guide took care of everything for us. Before I knew it, I was sitting up high on the back of a camel. Very. High. I was stiff and nervous, trying to get my feet into the stirrups, holding on with both hands, front and back. My handler tapped my foot away from the stirrup and said "Relax." So that is exactly what I did. I relaxed into the sway of the camel movement and trusted the handler to take care of everything. 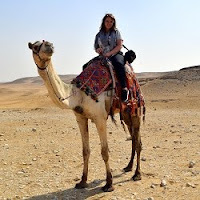 I was on a camel in Egypt visiting the Great Pyramids. It is an experience that I will never ever forget. We didn't have much time, so it wasn't the typical 1-2 hour camel ride. Just long enough to get some fun photographs and have the experience. Our handlers took our cameras and had us pose for dozens of silly photos, holding onto the tips of the pyramids, kissing on camel back. We finally told them we'd had enough. We just wanted to enjoy the scenery and the experience. This is definitely one of the photos that will be framed on silver-haired Selena's nightstand. Me. On a Camel! In Egypt! Getting on and off wasn't nearly as difficult as I imagined. I completely enjoyed riding on the back of the camel. We did have a bit of an incident with Matt's handler, but I'll let him tell you about it in a future post. It didn't take away from the experience at all and gave us a good story to tell later. There were so many special moments and experiences and thoughts in Egypt. I'll never be able to write about them in a way that conveys what it really felt like. I think that's why I love the photos so much. I'm hoping someday looking back on these photos will remind me of those moments and bring up those thoughts about life and the world in which we live. Which special photos convey to you a life well-lived?